Oh I love them. and yes they can be a pain but you did very well. Glad it's over, I know. I want to make some 3D pinwheels soon. I have a baby quilt I need to make soon and may try some on it. Easy, no I wouldn't go that far! Ha Ha Beautiful work!!!!!!!!!!!!!!!!!! I agree they are not easy. You did a great job. Just wonder how your are going to keep the neighbors off your porch swing once you have that on it! 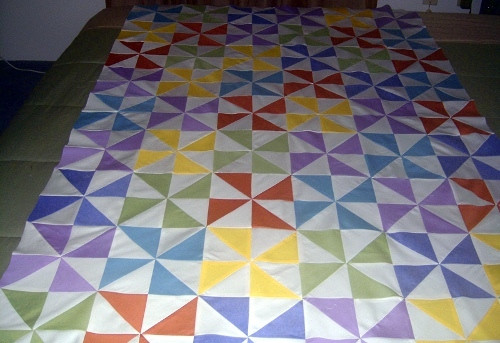 Oooh, love your pinwheel quilt! It's one of my favorite quilt blocks, it seems like I end up with pinwheels in lots of my quilts, generally only a few mixed with other blocks. I find them easy to do and easy to look at. I especially like them in kids quilts, which I do for Project Linus. 3D pinwheels are so easy. There was a tutorial on here a few years ago and I followed it and made my DGD a beautiful baby quilt; of course she was 2 when I finished it because I procrastinate alot but at least its done and with a lable with all important info on it and a cat because she loves all animals. This is beautiful!!! Worth the work, I would say. I LOVE pinwheels and yours is beautiful!!!! Someone will love it! Pinwheels are easy if you don't care how the centers match up! If you want the centers to match, they are not easy for me. I even have trouble getting the centers flat enough to quilt them well. Love the quilt -- you did a great job on the pinwheels. Sorry you had a bad time -- I can sympathize about not figuring things our correctly. Good job!! Years ago I started a Pinwheel when I was still really new to piecing and I thought it would be a little more festive thana plain 4P. Oh boy, was I surprised when every point was cut off and every center had so many bulky seams. A big disappointment for me then. Your top turned out great. It is a very happy quilt and not 'too busy' to my eyes. I think it is great. As you can see from my avatar, been there done that! And when I got to the end I had one flying backward. You did a great job! Anything with "Pinwheel" gets my attention! I think your quilt is FABULOUS! Doesn't look busy to me at all. I love the colors that you used and I would love to have a chair on my porch (or my sewing room!) covered in it! Great idea to use it for the cover of the porch swing. Please post a picture when you get it all put in place, I would love to see it!!! I haven't tackled the pinwheel yet. Yours look great. I really like the colors. Sorry you had so many problems. Don't be discouraged; your quilt looks great! I wouldn't call it busy, just active. If you want to calm it down, try a narrow white border, than a fairly wide solid border from one of your pinwheel fabrics. But I think once you quilt it, then drape/gather it on your swing, it won't look so busy. Try it out by draping the unfinished top on your swing. Either way, you've done a great job. I think they are beautiful. You did a great job!!!! I love your pinwheels. I love the colors. Two thumbs up!! I have made many pinwheels and they have ALL been a learning experience. I'm not sure what your asking for suggestions on. But, I think I would keep the border in a plain color. So that your pinwheels SOAR! The time you spent matching them was well worth the effort, you quilt top is very pretty. Great job! Your reward for all the hard work will be cuddling with the beauty. I think it's lovely, summery and bright! 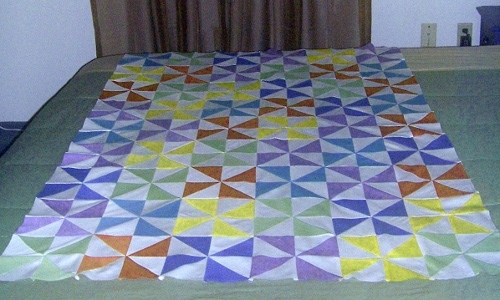 My very first quilt was a pinwheel with gorgeous lilac Waverly fabrics. I had no idea what I was doing and, sure there were some mistakes, but my daughter loved it anyway and still does. I'd bought so much of the co-ordinating fabrics that I had more than enough left over for matching shams and boutique pillows. She uses it to this very day!